On March 27, 2019, "Annie" as she was known to family and friends, unexpectedly passed away at the age of 43. Annie was born July 6, 1975 and grew up in Gladstone and lived in Kansas City, Missouri. She graduated Oak Park High School in 1993. She was active in sports and band; she was a Wrestling Manager, excelled in Jazz Band and was a Drum Major for the Marching Northmen. Annie was a loyal and dedicated employee with Allied National for nearly 20 years. On January 20, 2005 her son Luke was born whom she loved and raised with all her passion. Scouting has always been a part of Annie's life. Starting with Brownies and Girl Scouts throughout school, she spent many years as a camp counselor. She was a Certified Life Guard and a Rappel Master. Known at camp as 'Catfish', Annie was a Lifer and earned the Girl Scout Gold Award. Annie and Luke both became members of Boy Scout Troop 179 at Avondale United Methodist Church. She was Den Leader from 2012-2015, moving to Scoutmaster in 2018 to present. 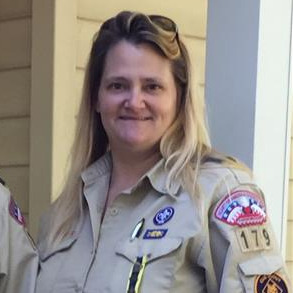 She was a merit badge counselor and recently earned the Wood Badge Award. She is an Honored Woman in the Tribe of Mic-O-Say and chose 'High Flying Green Eagle' as her tribal name. Annie's other passions included camping, hiking, music, spending time with family and friends, all Kansas City sports teams, her many pet animals, and just sitting around the camp fire. Annie is survived by her son Luke Casebolt, fiance Michael Wood, maternal grandmother Angeline Hinkle, her parents David and Karol Relford, brother and nephew David and Dakota Relford, several aunts, uncles and cousins. On Wednesday April 3, visitation will begin at 4:30pm followed by a Celebration of Life Service at 6:00pm at Avondale United Methodist Church located at 3101 NE Winn Rd., Kansas City, Missouri 64117. In Lieu of flowers, please make contributions to Boy Scout Troop 179 or Avondale United Methodist Church to keep this partnership strong. Our beloved Annie will always be in our hearts and greatly missed. It has been a honor and a blessing for me to have served in the Scouting program with Annie. Her energy and positive attitude for our boys will not be forgotten. I pray for God's comfort during your time of need. I always enjoyed talking to Annie at work. She was full of energy and joy, and her favorite topics were Luke and the Scouting program. Most of all, I will miss her wonderful smile. Respectfully submitted a link the Tribe of Mic O Say FB page. Her work is done. I have very fond memories of Annie through high school and as a next door neighbor for many years in Gladstone. Prayers for all her family and friends. She is with her heavenly father now! So very sorry for your loss. Prayers for everyone. Share your memories and celebrate the good times. Losing a loved one changes our world. She will live in those memories and stories every time they are shared. Hugs to all. Sending love to your family. Annie was a wonderful lady, and I am so saddened to hear of her passing. May she rest in eternal peace and the good Lord place his hands upon the families shoulders and give them the strength to see their way through this. My prayers and thoughts are with Karol & Dave and Annie's entire family at this sad time. May God comfort each of you. We are so sorry for your loss, and are praying for your family. We love you both. Annie was a special person who will never be forgotten. She had a zest for life and love of her son Luke. My thoughts and prayers to Luke and Annie's entire family that God will comfort them in this time of sorrow. I am a better person for having known such the wonderful person that is my friend Annie. I met Annie as my account manager at Allied. We had an instant connection and I always looked forward to talking to her throughout the week. She talked about her son and all of their adventures with me. She was such a hard worker and always made me feel important when I called. I'm so sorry for your loss. She was a wonderful person and she will be greatly missed. Many of us remember Annie "Catfish" as our awesome fellow camp counselor. We were Future They's and did all of the counselor training program and were Kitchen Kids together too when we were 13. She was always ready with a laugh and a song, and it was a privilege and a joy to have known her. I know she poured her heart into Scouts with her son and got just as much joy from watching his successes. Luke and family, my deepest condolences and prayers go out to you. Catfish, you're on your way and I'm so sad to miss your final campfire. Safe travels my friend. Prayers and condolences to Annie's family and friends and to Michael and his family. So very sorry for your loss. She was amazing and is now enjoying the promises of Christ.